Put your data to work. Any device. Any place. 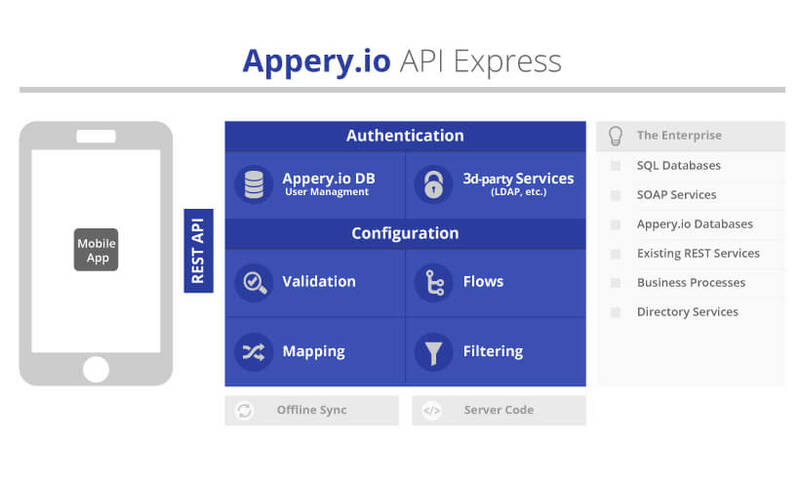 Appery.io API Express enables enterprises to easily and securely integrate apps with any back-end system. API Express comes with additional features like offline synchronization included, and can be deployed as a standalone product. As responsive mobile and web apps become more important for customers and employees, the need to connect these users with enterprise assets and services becomes paramount. However, the best way for apps to be connected is through REST APIs. Rewrite everything from the ground up as REST APIs? No. Use API Express instead to seamlessly integrate your legacy assets easily and cost-effectively. Get an API quickly when you need one. Take existing enterprise assets and roll them out as API REST services instantly. Need to present the same asset in different ways through different APIs? API Express fills the gap. With its ease of API creation, you have complete flexibility and quickness in implementing your API strategy. API REST services created through API Express allow you to control and monitor access to your assets by creating a “RESTwall” for the assets. The Appery.io platform provides security and metering of API use. The API Express configuration tool includes a variety of options for validation, filtering, and mapping to control exactly how you expose your assets for use. And, it fits well into third-party API management platforms. Hackathons and demos are an unheralded, but important, part of the mobile app world. Appery.io is already well-known at hackathons because of its raw speed of development for apps and its out-of-the-box backend services. API Express adds an additional dimension to Appery.io for use in hackathons and demos. Its speed allows the quick creation of APIs on-the-fly for serving data to your apps either from existing assets or just to provide testing data. Easily expose any SQL database query as a REST service, using Oracle, Microsoft SQL Server, MySQL, PostgreSQL, etc. Connect to any SQL database for CRUD operations (create, read, update, and delete). Use the full power of SQL inside a REST service by just specifying a few connection parameters. Instead of rewriting an existing SOAP-based web service, use API Express to present it as a mobile-ready REST service. No conversion necessary. Continue to run the SOAP service and, with a WSDL file and a few configuration parameters, it can easily be integrated into mobile apps as a REST service. Easily expose this NoSQL database’s requests as a public REST service via API Express. Use the created REST service to connect for CRUD operations (create, read, update, and delete). Expose an existing REST service as a new REST service for security or functional purposes. A single-endpoint REST-to-REST service can be used to “alias” a REST service in case you change the endpoint, to limit the scope of access to the endpoint service, or even to provide a set of different “windows” into the endpoint REST service for different uses or users. Expose muiltiple existing REST services as a new REST service for security or functional purposes. Aggregate several REST services together as a new API. API Express makes the orchestration process as smooth as it can possibly be. Make “mashup”-style APIs drawing from a variety of sources for many purposes. Easily configure tight security for your API service using our platform’s authentication server. Take advantage of roles and permissions to fine-tune security for your service. Use an API service to flexibly narrow or broaden access to an asset. Build on this to easily add features like Single Sign-on. Take advantage of zero-install and extensive scalability. Benefit from the administrative and security benefits of our hosted cloud service. Benefit from the cloud, both in terms of development and operations. For more control, install API Express behind your own firewall. Our team stands ready to assist you in smoothly implementing your own API Express. Our onsite install can support clustering and limits. Use the platform’s built-in Offline Sync backend service. Devices can’t always be online, particularly when these devices are used by field users such as sales or service personnel. Our synchronization service works to ensure that the data for your API Express-created REST services (or any services) is in sync on both ends. API Express is an integral part of Appery.io, a complete low-code platform for rapid development of cross-device applications. With the Appery.io App Builder, developers can easily build mobile and responsive apps that consume an API service created with API Express, or any other service. Take advantage of the clean, well thought-out Appery.io App Builder and enjoy maximum productivity. API Express is available for standalone Deployment, allowing enterprises to quickly mobilize existing systems with RESTful APIs. This is great for enterprises, as many organizations are still constrained by legacy applications that are not mobile friendly. API Express Standalone is also ideal for situations where enterprises prefer to deploy it behind their firewall, while still leveraging the rest of the Appery.io Platform from the cloud. Enterprise deployments of API Express include support for a Java SDK to create custom modules as part of the services. With this, SDK customers can build modules that extend the capabilities of the capabilities of the platform. Using Apache Camel, a well-known and tested open-source Java framework, you can incorporate your own integration logic into API Express, which acts as an execution engine.